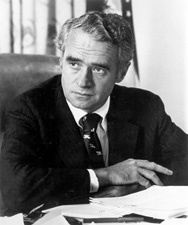 Thomas Eagleton was one of the first U.S. Senators to vocally oppose the Vietnam war, and the primary author of the War Powers Act, which limited the authority of the president to wage war without congressional approval. He was briefly the Democratic Vice Presidential candidate with George McGovern in 1972, until revelations that he had once undergone shock therapy forced his removal from the ticket. St. Mary's Hospital, Richmond Heights, Missouri.